NABSQNO 12S-685761-4323598. This unnamed arch is an adult alcove natural arch. The wall the opening penetrates is well separated from the occluding cliff. It has formed in a butte of Entrada sandstone known as Battleship Rock, on private property about 6 miles northwest of Glade Park in Mesa County, Colorado. 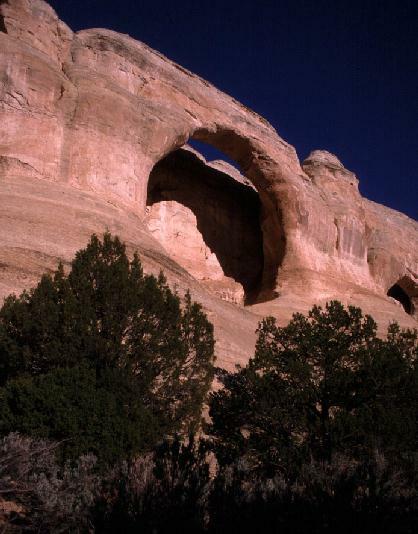 There are two smaller alcove natural arches just to the north in the same butte. Close access to the arch requires permission of the landowner, but it is easily visible, about a quarter mile to the west, from public and graded 11 Road. The arch has a span of about 30 feet. © 2003,2009 by Jay H. Wilbur, All Rights Reserved.